Each send that’s performed using GreenArrow Engine has a Send Statistics page. These pages are linked to and can be searched for from the Send Statistics Overview Page. Mailing List(s) - If GreenArrow Engine is able to determine the mailing list name(s), it shows them here. Otherwise, the ListID(s) are shown. See the Send Statistics Integration page for details on how GreenArrow Engine associates ListIDs with mailing list names. See the GreenArrow Concepts page for details on ListIDs. Class / Category - The injecting application. The two most common examples are GreenArrow Studio for messages that were generated by GreenArrow Studio, or a blank column if the source is unknown. See the Send Statistics Integration page for details on how this column is populated. Description - If GreenArrow Engine is able to determine the campaign’s name, it shows it here. Otherwise, the SendID is shown. See the Send Statistics Integration page for details on how GreenArrow Engine associates SendIDs with campaign names. See the GreenArrow Concepts page for details on SendIDs. Sent - The times that the first and last messages in this send were received by GreenArrow Engine. This is followed by how much time elapsed between the first and last messages. Total Sent - the number of messages sent in this campaign. Succeeded - the number of messages that GreenArrow was able to deliver. Bounced - the number of messages that bounced. Still In Queue - the number of messages that are still in GreenArrow’s queue. GreenArrow will continue to retry to deliver these messages for up to 2 days before giving up. Recipients Opened - the number of recipients who loaded images. Recipients Clicked - the number of recipients who clicked one or more links. Unsubscribe link clicks are not included in this total. Recipients Unsubscribed - the number of recipients to clicked on an unsubscribe link. If the GreenArrow Monitor seedlist was sent to with this campaign, then this section will include a summary of GreenArrow Monitor’s results. More detailed data can be viewed by clicking on the GreenArrow Monitor tab, or by logging into GreenArrow Monitor’s website. Spam complaints from feedback loops are listed at the bottom of this page. Spam complaints are listed by domain. The list of domains automatically expands to include all domains for which at least one complaint occurred. The Open Stats tab is only displayed if SimpleMH is used for a send. When present, this tab shows stats on subscribers who opened the send. An open occurs when a subscriber load images. Messages that are sent from GreenArrow Studio have their opens tracked in GreenArrow Studio’s stats. The Click/Link Stats tab is only displayed if SimpleMH is used for a send. When present, this tab shows stats on links that were clicked. Both total and unique clicks are tracked. Totals are reported for both all links and for each distinct URL for which at least one click occurred. Query strings that follow a questions mark in the URL are stripped off for reporting purposes. For example, http://www.example.com/signup.php?sub=1234 and http://www.example.com/signup.php?sub=2345 are both tracked as http://www.example.com/signup.php. Unsubscribe link stats are currently included in this tab’s figures and can be identified by looking for URLs that begin with ##unsubscribetag##. Messages that are sent from GreenArrow Studio have their clicks and unsubscribes tracked in GreenArrow Studio’s stats. If the GreenArrow Monitor seedlist was sent to with this campaign, then this tab will include a summary of GreenArrow Monitor’s results. More detailed data can be viewed by logging into GreenArrow Monitor’s website. The SMTP Server Stats tab lists SMTP level stats, both by domains and in total. Domain - The domain name in the email address. For example, gmail.com. 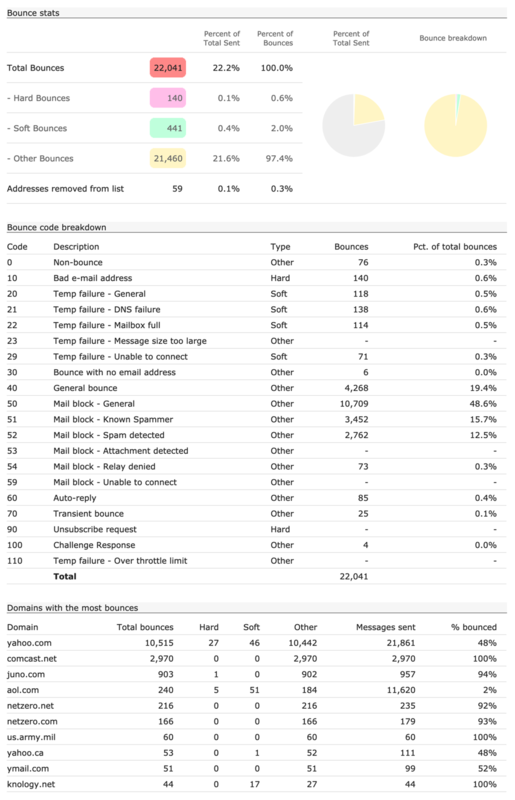 Total Msg - The total number of messages send to the domain represented by this row. % Total - The percentage of the mailing list that this domain represents. Success - The number and percentage of messages that were successfully delivered. This number only tells you whether the messages was delivered, not where it went to the Inbox. GreenArrow Monitor can be used to gather Inbox data. Failure - The number and percentage of messages that bounced synchronously, or while a delivery attempt was taking place. Asynchronous bounces are processed by GreenArrow Engine, but not reported in this column’s figure. You can click on a domain’s Failure percentage to view the 20 most frequent failure messages, sorted by frequency. Still Trying - The number and percentage of messages that are still in GreenArrow’s queue. These messages were either deferred or throttled. You can click on a domain’s Still Trying percentage to view the 20 most frequent deferral and throttle messages, sorted by frequency. Attempts Deferred - The percentage of delivery attempts that had a deferral take place. This figure is useful because if there is a deferral problem on a send, this column will always show it. The Still trying column will only indicate a deferral problem as long as there are still messages in the queue. You can click on a domain’s Attempts Deferred percentage to view the 20 most frequent deferral messages, sorted by frequency. Attempts Throttled - The percentage of delivery attempts that would be made, but were throttled by GreenArrow Engine’s throttling mechanism. GreenArrow Engine comes with a default set of throttling rules which can be adjusted. This figure gives an indication of if the throttling settings are slowing down SMTP deliveries. Usually, this figure is at, or close to 0%. If there is a low throttle setting or messages are being injected quickly, you’ll see a higher percentage here. For more details on throttling, see the GreenArrow Engine Throttling Page. Towards the bottom of the SMTP Server Stats tab is a linked labeled View result for each message. Clicking this link will bring you to a page which allows you to view the results for individual messages. You can filter results by individual email address, domain, or local part (the portion of the email address before the @ sign). You also have the option of downloading the results of your search as a CSV file. The Controls tab can be used to pause deliveries for a send or dump a send from the mail queue. See the Pausing and Dumping Queues page for details.